1. INTRODUCTION & IMPORTANCE OF MECHANICAL VIBRATION: Brief history of Mechanical Vibration, Types of Vibration, Simple Harmonic Motion (S.H.M. ), Principle of superposition applied to S.H.M., Beats, Fourier Analysis, Concept of degree of freedom for different vibrating systems. 2. UNDAMPED FREE VIBRATION OF SINGLE DEGREE FREEDOM SYSTEMS: Modeling of Vibrating Systems, Evaluation of natural frequency – differential equation, Energy & Rayleigh’s methods, Equivalent systems. 3. DAMPED FREE VIBRATION OF SINGLE DEGREE FREEDOM SYSTEMS: Different types of damping, Equivalent viscous damping, structural damping, Evaluation of damping using free and forced Vibration technique, Concept of critical damping and its importance, study of vibration response of viscous damped systems for cases of under damping, critical damping and over damping, Logarithmic decrements. 4. FORCED VIBRATION OF SINGLE DEGREE FREEDOM SYSTEMS: Steady state solution with viscous damping due to harmonic force, reciprocating and rotating unbalance mass, vibration isolation and transmissibility due to harmonic force excitation and support motion. Vibration measuring instruments – vibrometer and accelerometer. Whirling of shaft with single disc and with our damping, Concept of critical speed and its effect on the rotating shaft. 5. UNDAMPED VIBRATION OF TWO DEGREE FREEDOM SYSTEMS: Free vibration of spring coupled and mass coupled systems, Longitudial, Torsional and transverse vibration of two degree freedom systems, influence coefficient technique, Un-damped vibration Absorber. 6. INTRODUCTION TO MULTI-DEGREE FREEDOM SYSTEMS: Normal mode vibration, Co-ordinate coupling-close coupled and far coupled systems, Orthogonality of mode shapes, Methods of matrix iteration, Holzer’s method and Stodola method. Torsinal vibration of two, three and multi-rotor systems. Dunkerley’s lower bound approximate method. 7. CONTINOUS SYSTEMS: Vibration of strings, longitudinal vibration of rods, torsional vibration of rods, transverse vibration of Euler-beams. 1. Theory of vibration with Applications: W.T. Thomson and Marie Dillon Dahleh, Pearson Education 5th ed. 2007. 2. Introductory Course on theory and Practice of Mechanical Vibrations. J.S. Rao & K. Gupta,New Age International Publication, New Delhi, 2007. Principles, Component of hydrostatic lubrication , Hydrostatic circular thrust bearing , calculation of pressure, load carrying capacity, flow rate , power loss in bearing due to friction. Theories of friction, surface contaminants, Effect of sliding speed on friction, classification and mechanism of wear, Wear resistant materials. mean stress on fatigue : Gerber, Goodman and soderberg’s criteria. Effect of compressive cyclic stress on fatigue. Fatigue design formula for axial, bending, torsional and combined loading. Fatigue controlling factors: Effect of frequency, Temperature, size, form, stress concentration factors, Notch, sensitivity & surface conditions, residual stresses. Improvement of fatigue strength’ by chemical/metallurgical processes such as ritriding, flame hardening, case carburizing. Fatigue strength enhancement by mechanical work: cold rolling, peening, shot peening. Fracture Mechanics: Ductile and brittle fracture Theoretical cohesive strength of metasl, Griffith Theory of brittle Fracture, Oruron’s modification to Griffith Theory. Modes of fracture : Mode I, II and III, fatigue creek growth Behaviour of metals, Linear Elastic Fracture Mechanics (LEFM), Stress Intensity Factor(SIF), Stress field near the crack tip, Critical SIF and Fracture Toughness, Experimental determination of fracture toughness KIC, COD gauges andstandard ASTM Tests. Strain Energy Release Rates (SERR), Elasto-Plastic Fracture Mechanics (EPFM), Plastic zone size and its evaluation, J-Integral Method.Creep Analysis:Definition, Constant stress and constant, strain creep tests. Uniaxial creep tests: Baily’s Power Law,Creep relaxation: strain hardening and time hardening creep relaxation. Introduction to Creep bending and deflection of simple problems. 1. L.S. Srinath, Advanced Mechanics of Materials, – Tata Mc Graw Hill Ltd., ND, 2009. 2. Norman E, Dowling, Mechanical Behaviour of Materials, – Prentice Hall, NJ, 1999. 1. Fundamentals of Robotics: Evolution of robots and robotics, Definition of industrial robot, Laws of Robotics, Classification, Robot Anatomy, Work volume and work envelope, Human arm characteristics, Design and control issues, Manipulation and control, Resolution; accuracy and repeatability, Robot configuration, Economic and social issues, Present and future application. 2. Mathematical modeling of a robot: Mapping between frames, Description of objects in space, Transformation of vectors. Direct Kinematic model: Mechanical Structure and notations, Description of links and joints, Kinematic modeling of the manipulator, Denavit-Hartenberg Notation, Kinematic relationship between adjacent links, Manipulator Transformation matrix. 3. Inverse Kinematics: Manipulator workspace, Solvable of inverse kinematic model, Manipulator Jacobian, Jacobian inverse, Jacobian singularity, Static analysis.4. Dynamic modeling: Lagrangian mechanics, 2D- Dynamic model, Lagrange-Euler formulation, Newton-Euler formulation. 5. Robot Sensors: Internal and external sensors, force sensors, Thermocouples, Performance characteristic of a robot. 6. Robot Actuators: Hydraulic and pneumatic actuators, Electrical actuators, Brushless permanent magnet DC motor, Servomotor, Stepper motor, Micro actuator, Micro gripper, Micro motor, Drive selection. 7. Trajectory Planning: Definition and planning tasks, Joint space planning, Cartesian space planning.8. Applications of Robotics: Capabilities of robots, Material handling, Machine loading and unloading, Robot assembly, Inspection, Welding, Obstacle avoidance. 4. Robot Dynamics and Control, M.W.Spong and M. Vidyasagar , Wiley India. 5. Industrial Robotics Technology, programming and application, M.P.Groover, TMH. Empirical distribution, Generation of pseudo random numbers, Analysis of simulation data,Parameter estimation, Goodness-of-fit tests, Multivariable timeseries models. Overview of feedback control systems, Dynamics of mechanical systems, Differential equations and state variable form, Models of electro mechanical, Heat-and fluid flow models, Linearization and scaling, Models from experimental data, Dynamic response using pole-zero locations, Time domain specifications, Classical 3-term controllers and its digital implementation, Stability analysis by Routh Criterion. Simulation of manufacturing and material handling systems, Goals and performance measures, Modeling downtime and failures, Trace driven models, Case studies. 1. Discrete-Event system simulation by Jerry Banks, J.S. Carson, B.L. Nelson and D.M. Nicol (Pearson Publications). 2. Feedback control of dynamic systems by G.F. Franklin, J.D. Powell, A-Naeini, Pearson Publications. 3. Simulation modeling and analysis by A.M. Law, W.D. Kelton, Tata McGrawHill Publications. Evolution of Mechatronics, components of mechatronic system, types of mechatronic products, Signal theory, signal analysis and processing, Laplace transformation, Z-transformation modulation and de-modulation. Basic Digital Technology : Digital number system, Binary number system, Hexadecimal number system, Binary addition, Boolean Algebra, Logic function, Universal GATES, FLIP-FLOP, Registers counters. System modeling : Frequency response, Mechanical system, electrical system, Thermal system, Fluid system. Transducer and Sensors : Principles, difference between transducer and sensors, transducer types – photo emissive, photo conductive, photovoltaic, thermistors, Thermocouple, Inductive, capacitive, Peizoelectric, Hall effect transducers, Ionization transducer, Encoders- Incremental encoder, Optical encoder, Bimetallic strip, Strain gauge, load cell. Programmable Logic controller : Basic Structure – Programming : Ladder diagram Timers, Internal Relays and Counters – Shift Registers – Master and Jump Controls, data handling , Analog input / output , PLC Selection &Application. 1. G.K. Ananthsuresh, K.J. Vinoy, S. Gopalakrishnan, K.N. Bhat and V.K. Atre: Micro and Smart Systems, Wiley India, New Delhi, 2010. 2. N.P. Mahalik: MEMS, Tata McGraw-Hill, New Delhi, 2007. 1. T. Hsu: MEMS and Microsystems: Design and Manufacture, Tata McGraw-Hill, New Delhi, 2002. 2. The central differencing scheme – Assessment of the central differencing scheme for convection-diffusion problems – The upwind differencing scheme – Assessment of the upwind differencing scheme – The hybrid differencing scheme – Assessment of the hybrid differencing scheme – The power-law scheme – Higher order differencing schemes for convection-diffusion problems – Quadratic upwind differencing scheme: the QUICK scheme . 1. Implicit method for two- and three-dimensional problems – Discretisation of transient convection-diffusion equation – Worked example of transient convection-diffusion using QUICK differencing. 1. Versteeg, H. K. , Malalasekera W , An Introduction to Computational Fluid Dynamics-The Finite Volume Method, Longman Scientific & Technical. 3. Muralidhar, K. and Sundararajan, T., Computational Fluid Flow and Heat Transfer, Norosa Publishing House, N. Delhi. 1. Ozisik, M. N. , Finite Difference Method, CRC Press. Review of 2-D and 3-D stress analyses, vibration, fluid flow and heat conduction problems. FEM fundamental concepts, Variational principles, Rayleigh Ritz and Galerkin Methods. Finite Element Modeling of one dimensional problems. Finite Element Analysis of 2-D and 3-D framed structures. FEM formulation of 2-D and 3-D stress analysis problems. Axisymmetric solids subjected to axisymmetric loadings. Two-dimensional isoparametric elements and numerical integration. FE modeling of basic vibration problems Finite element modeling of fluid flow and heat conduction problems Computer programs: preprocessing and post processing.Exposure to commercial FE codes such as ANSYS, NASTRAN and IDEAS etc. Introduction: Basic concept of control system, Open loop and Close loop control systems. Control System and components. Laplace Transform: Laplace transformation, Laplace transforms theorems, inverse Laplace transform.Mathematical model of physical systems: modeling of fluid systems and thermal systems Liquid level systems, pneumatic systems, hydraulic systems, thermal systems. Feedback Characteristics of control systems, Types of feedback, effects of different feedbacks on control systems. Standard input signals, Step, ramp, parabolic and impulse inputs. Time response of fist and second order systems to input signals. Time response specifications, Steady state error and error constants of different types of control systems. Concept of stability , Necessary condition for stability, Routh’s stability criterion, application of Routh’s criterion for linear feed back system, relative stability. Root-locus analysis : Root locus concepts, rules for construction of root loci, root contours, systems with transportation lead and lag. Frequency response analysis : Bode diagrams, polar plots, Nyquist stability criterion, Stability analysis, relative stability in frequency domain. Controllers: Proportional, derivative and integral control actions, PD, PI and PID controllers and their applications to feed back control systems. Mathematical modeling of Dynamic systems in state space, state-space representation of mechanical and electrical systems. State equation and transfer functions, Characteristic equation , Eigenvalue and eigen vector of state matrix. Design of control systems in state space. Four bar linkage, Single slider crank mechanism and Double slider crank mechanism. 2. Mechanism Trains : Gear Terminology and definitions, fundamental law of gearing, Spur, bevel, helical, worm gears. Analysis of mechanism Trains: Simple Train, Compound train, Reverted train, Epicyclic train and their applications. 3. Friction Effects: Friction between pivot and collars, single, multi-plate and cone clutches, friction circle, friction axis. Classification of brakes, Analysis of internal expanding shoe brake, Absorption and transmission dynamometers, Rope brake dynamometer, Belt transmission dynamometer, Belt drives, Initial tension, Effect of centrifugal tension on power transmission, Maximum power transmission capacity, Belt creep and slip. 4. Mechanism for Control: Turning moment diagram, Turning moment diagrams for different types of engines, Fluctuation of energy and fluctuation of speed, Dynamic Theory of Flywheel. Governors – Watt, Porter, Proell, Hartnell, Wilson-Hartnell Governor, Performance parameters: Sensitiveness, Stability, Hunting, Isochronism. Introduction to Gyroscopes, Gyroscopic forces and Couple. 5. 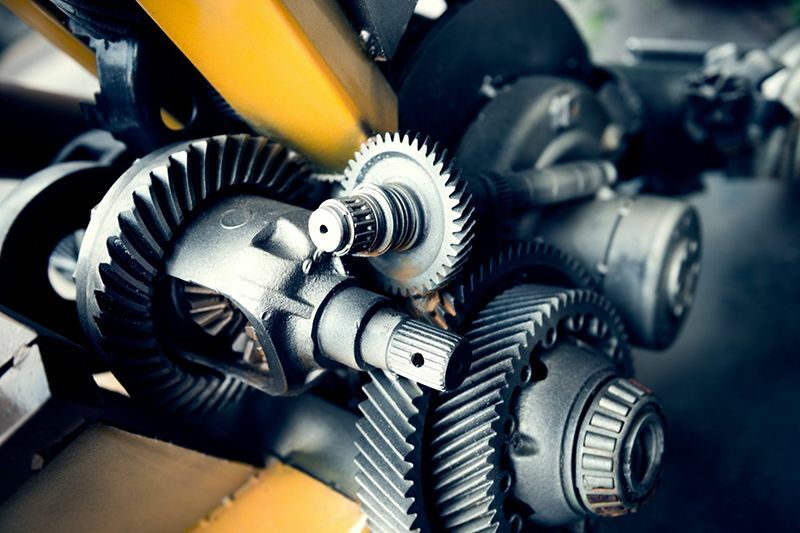 Mechanical Engineering Design: Introduction to design procedure, Stages in design, Code and Standardization, Interchangeability, Preferred numbers, Fits and Tolerances, Design requirements – properties of materials, Material selection, Use of Data books. 6. Fundamentals of Machine Design: Types of load, Modes of failure, factor of safety concepts, concept and mitigation of stress concentration, Fatigue failure and curve, endurance limit and factors affecting it, Notch sensitivity. 7. Machine Element Design: Design of Joints: Rivets and welds based on different types of loading, Boiler joints, Socket and Spigot cotter joint and knuckle joint. 8. Design of Keys, Shaft and Couplings: Classification of keys, Design of keys, Theories of failure, Design of shafts: based on strength, torsional rigidity and fluctuating load, ASME code for shaft design, Design of couplings: Rigid coupling, Flexible coupling. 2. Mechanism and Machine Theory by J.S.Rao and R.V.Dukipatti, New Age International. 4. Machine Design, Robert L. Norton, Pearson Education Asia. 2. Design Data Hand Book, K. Lingaiah, McGraw Hill, 2nd Ed. 2003. 4 .Design Data Hand Book by K.Mahadevan and B.Reddy,CBS Publisher. Neural Networks: Neuron Abstraction, Neuron Signal Functions, Mathematical Preliminaries, Neural Networks Defined, Architectures: Feed forward and Feedback, Salient Properties and Application Domains of Neural Networks, Multi-layered Network Architectures, Back- propagation Learning Algorithm, Practical Considerations in Implementing the BP Algorithm, Structure Growing Algorithms, Universal Function Approximation and Neural Networks, Applications of Feed Forward Neural Networks, Reinforcement Learning, Radial Basis Function Networks, Regularization Theory Route to RBFNs, Generalized Radial Basis Function Network, Learning in RBFNs, Associative Learning, Hopfield Network, Content Addressable Memory, Bidirectional Associative Memory, Self Organizing Feature Maps, Applications of the Self Organizing Map. Regression & Optimization: System Identification: an Introduction, Least Squares Estimator, Geometric Interpretation of LSE, Recursive Least Squares Estimator. Derivative-Free Optimization: Genetic Algorithms, Simulated Annealing, random Search, Downhill Simplex Search. 2. Principle of Soft Computing, S.N. Sivanandan& S.N. Deepa, Wiley India Edition,2010. Evolution of Mechatronics, components of mechatronic system, types of mechatronic products, Signal theory, signal analysis and processing. Basic electronics devices: junction diodes, Bipolar transistors Basic Digital Technology: Digital number system, Binary number system, Hexadecimal number system, Binary addition, Boolean Algebra, Logic function, Universal GATES, FLIP-FLOP, Registers counters. Overview of MEMS and Microsystems. Micromachining Techniques: Silicon as material for micromachining, Photolithography, thin film deposition, doping, wet and dry etching, surface and bulk micromachining, Wafer bonding, packaging. Microsystem Modeling and Design: Mechanics of deformable bodies, Energy method, Estimation of stiffness and damping for different micro-structures, Modeling of electromechanical systems, Pull-in voltage. MEMS Applications: Mechanical sensors and actuators: Piezoresistive pressure sensors, MEMS capacitive accelerometer, Gyroscopes, Piezoelectric actuators. 3. Micro and Smart Systems, G.K. Ananthsuresh, K.J. Vinoy, S. Gopalakrishnan, K.N. Bhat and V.K. Atre, Wiley India, New Delhi, 2010. 4. N.P. Mahalik: MEMS, Tata McGraw-Hill, New Delhi, 2007. 5. T. Hsu: MEMS and Microsystems: Design and Manufacture, Tata McGraw-Hill, New Delhi, 2002.